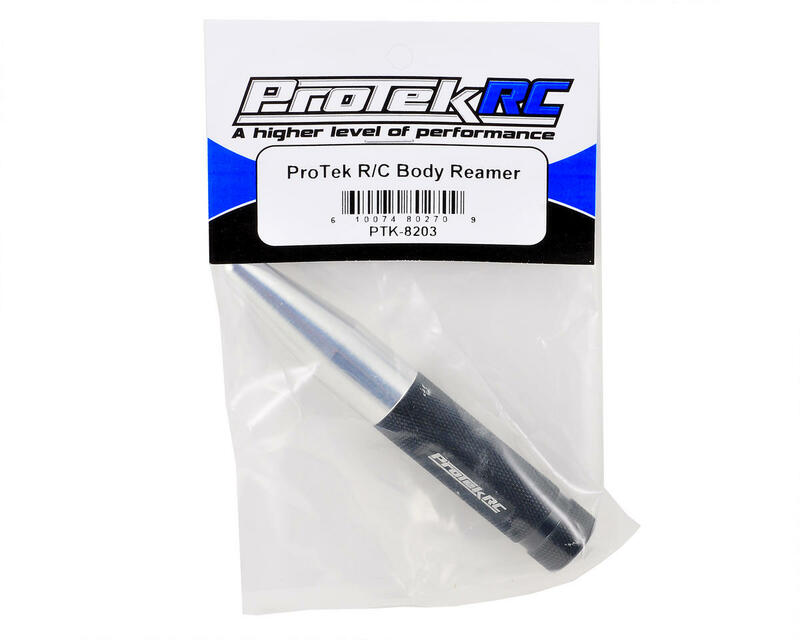 This is the ProTek R/C "TruTorque" Body Reamer. No one wants to spend money on low quality tools. Tools are an investment that should not be taken lightly and are one of the few items that should outlast the life of the model you are working on...and remain with you for years after. With so many choices available, the decision can be overwhelming. So ProTek R/C has stepped up again, expanding its product line with a complete range of affordable, high quality tools that help to make the decision a little easier. This body reamer features a double edged cutting head, with one side that displays inch increments up to a 1/2", while the other side has millimeter increments up to 12mm, and the head has an overall boar size of 0.60"/15.3mm. The double edge design makes it easier to keep the hole centered, and the measurements allow you to make precision sized holes in lexan/polycarbonate type material. Lastly, an o-ring in the handle is used to secure the cap, protecting you and the tool from damage or injury. I purchased an OFNA reamer about 7 months ago and have never been happy with it. I saw the ProTek reamer and decided to give it a try and I love it! Very nice quality for the price, and it's sharp and easy to use. I am very happy with it, give it a shot if you need a reamer. Another good one from Protek. This is a must have for your collection of RC tools. So much easier and quicker than using drill bits to get the correct size hole in your lexan body. It's really sharp and I had no problem cutting a dozen 6mm holes into a couple lexan wings made out of really thick lexan. With thinner lexan it cuts through like butter. Excellent Product; Sharp and Fast. The Cap closes tightly with the added rubber ring. Highly recommended. Another Great Product ProTek !! Excellent reamer. Extremely sharp, no hanging up on the lexan, just cuts perfect holes. I have an old DuBro one that I bought YEARS ago, it has been the only one I have ever used. THIS ONE IS AWESOME!! its heavyish, cap fits tight and SHARP! I love the measurements on the side to ensure I get even sized holes. This is my first reamer, don't see any reason for me to buy another one until this one goes dull! Sizes are clearly marked, does a great job leaving a clean hole in the lexan, and has a nice grip on it. Very pleased with this purchase! Love this tool, very sharp and the size indicators on the side are very useful! Excellent! Super sharp and makes great cuts. Measurement indicators on both sides in metric and imperial are perfect! Great tool. 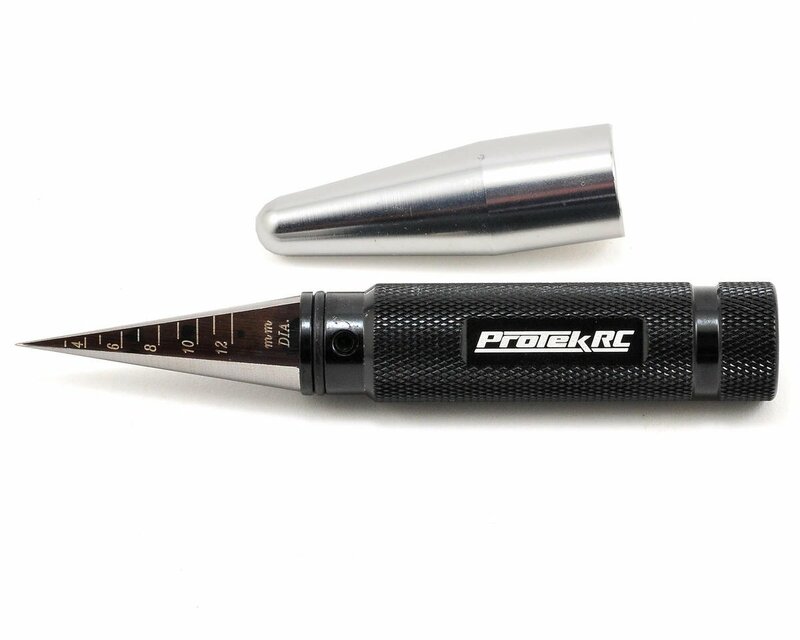 Awesome reamer from Protek has a great weight and feel to it. The reamer is extremely sharp and is built to last. The one thing that may bother some are the markings for sizes do wear fast, but for me not a deal breaker. This is a must have tool for anyone in the hobby. Works great for me and graduation marks seemed accurate enough. Recommended. I bought this reamer based on the reviews. It doesn't disappoint. I've used this reamer on 4 different bodies for various jobs and I have no complaints. It's easy to grip and leaves a nice, clean hole. If this ever dulls, I'm definitely buying the same one. Awesome tool. Highly recommended. I like the Oring sealed cap so it stays on and it's very sharp and makes clean cuts. this body reamer is super sharp and with an oversized grip makes it easy to use. measurements are easy to read and should be in everybody's pit bag.